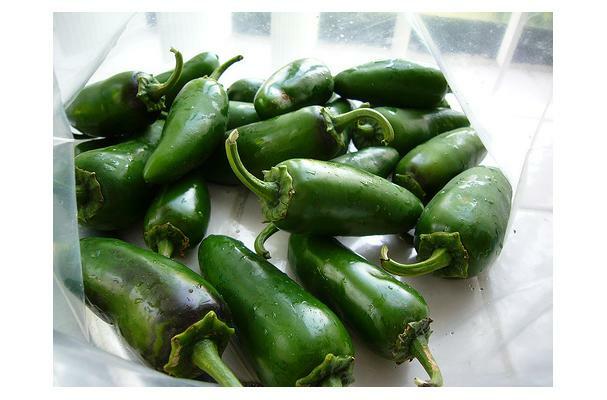 A hot green pepper from Mexico with medium level of spice and a waxy skin. It is green but turns red as it ripens. It is popular throughout Mexico and the United States, especially in the Southwest. Most of the spice is in the seeds and ribs that hold the seeds. If you remove these before eating, the pepper is actually quite mild. ( chipocle) ; most of the time you will find it marinated and canned. #KitchenTip: Coat hands with olive oil to prevent spicy jalapeno oils to adhering to your fingers when slicing and seeding peppers.